It has been a busy time here with too much work and getting the garden going and coping with health issues. And though I think about keeping both of my blogs updated, after the Amanda hive tragedy it was hard to sit down and write about bees. It has, actually, been hard to sit and write anything. I am not one of those people who believe I have to grunt through writing even when it doesn’t feel good. There has to be a driving intent, a purpose to what I write. But I am always doing something writing related, usually research or editing. 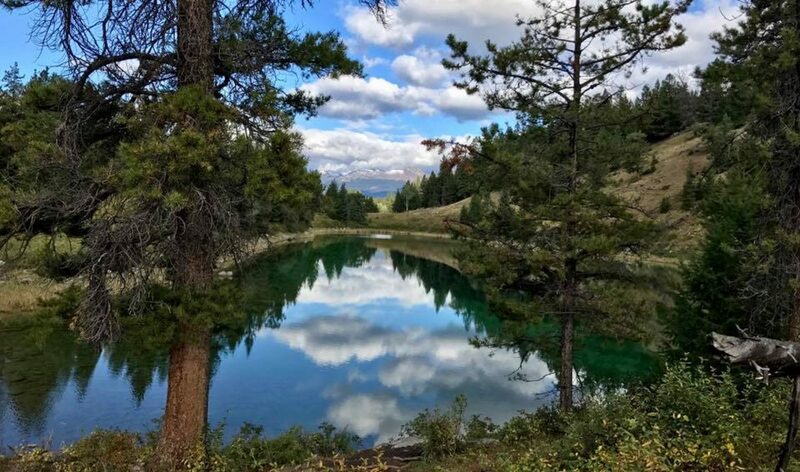 I always have a lot of projects going on at once ( I am currently working on a novel as well as keeping my other blog Robynlynnwriter) and there always seems to be something to edit even when new work seems daunting. So far, the resistance eventually always wears out and writing becomes fun and easy again. But the sun has been out, work is petering off and today has been all about orientation for the bees and reorienting myself with my blog writing! 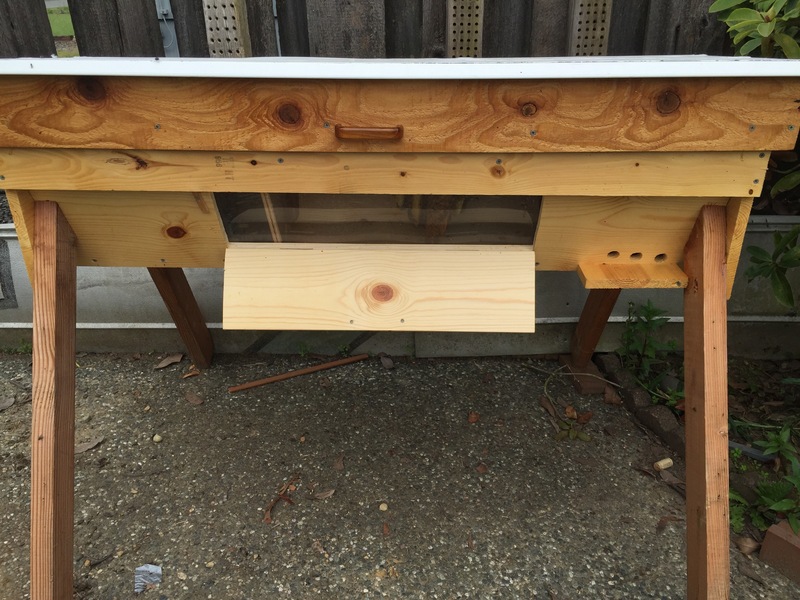 We have a new hive at our house, a lovely windowed top bar that Neil built. It found a home against the fence and near a small apple tree in our yard. 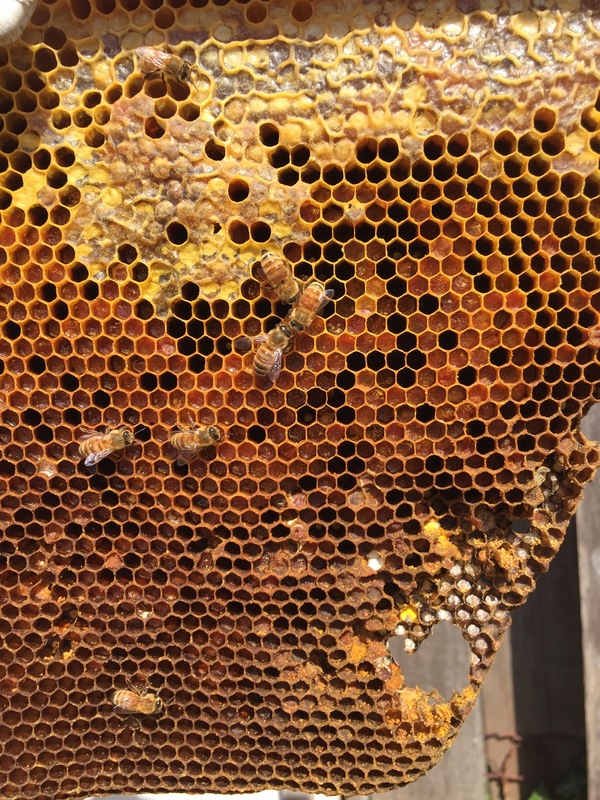 (IMPORTANT NOTE: The house that shares the fence is not occupied – technically this hive should be several yards way from fence lines, but the homeowner doesn’t care. 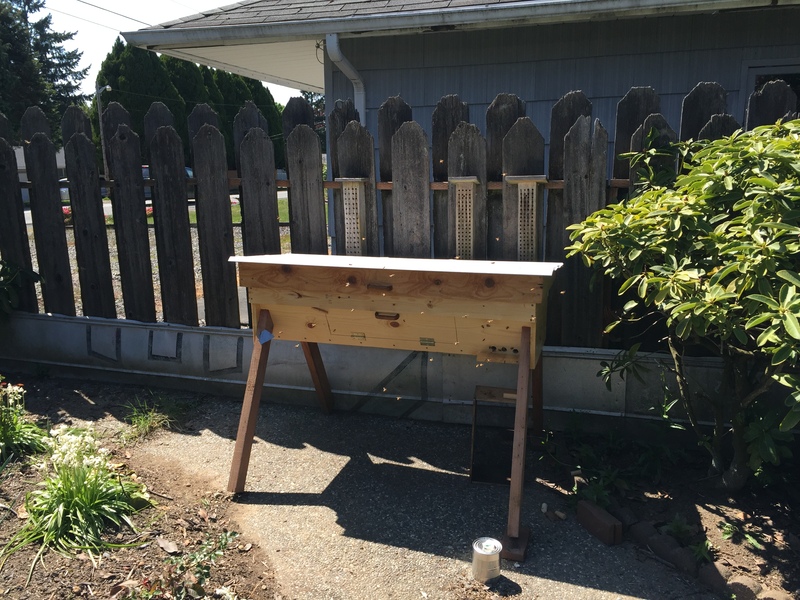 Make sure to talk to your neighbors before installing hives in urban farming areas!) 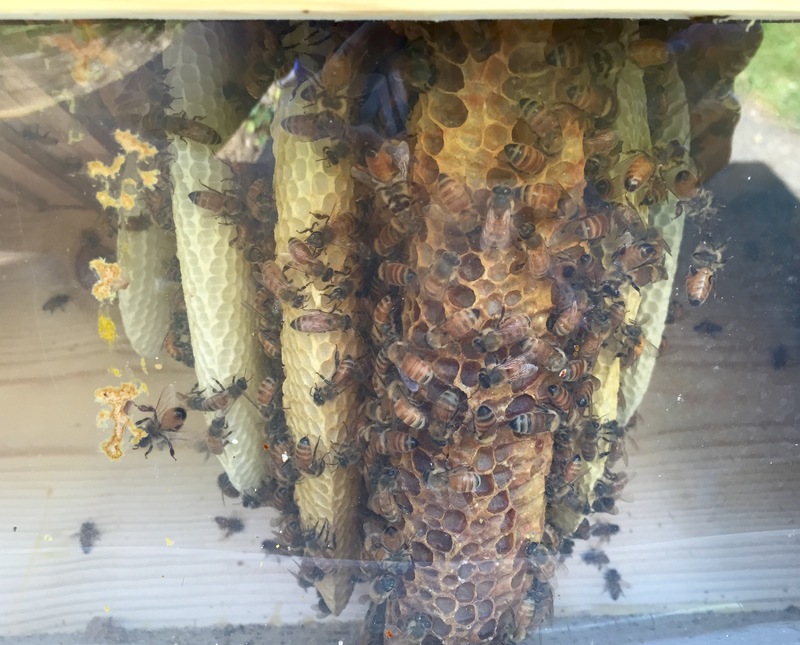 Even though our year old hive (called Amanda) is also in the process of expansion, there is something about new bees getting established in a shiny new hive. The new Apple hive with its viewing window open. The new Apple queen has started off laying slow and spotty. She is a shy thing but her sisters are very protective of her when I pull the bar she is on. Due to a broken foot, I was beekeeping in flip-flops yesterday (NOT A GOOD IDEA) and was jumpy when they got a bit riled. Some smoke calmed them down and I finished up quickly before I could get any good pictures of the newly capped comb. See the middle one with matted hair and tucked wings? New bees don’t go far from home for the first three weeks except for orientation flights to get themselves established . During this time they all seem to go out for their first flight in a group at the exact same time nearly every sunny day. They fly out of the hive and do whatever they do, then hover in place facing the hive, like news helicopters over a highway crash scene. New bees on their orientation flights appear to just be hanging out or waiting their turn to go inside and there can be quite a cloud of them for fifteen to thirty minutes before everyone goes back in. I would suggest staying away from them when they are hovering….the only time I’ve been stung without cause (on the nose, no less!) was during a particularly large orientation flight I was trying to take a picture of – several feet away! See all the little flying specks? Helicopter bees! 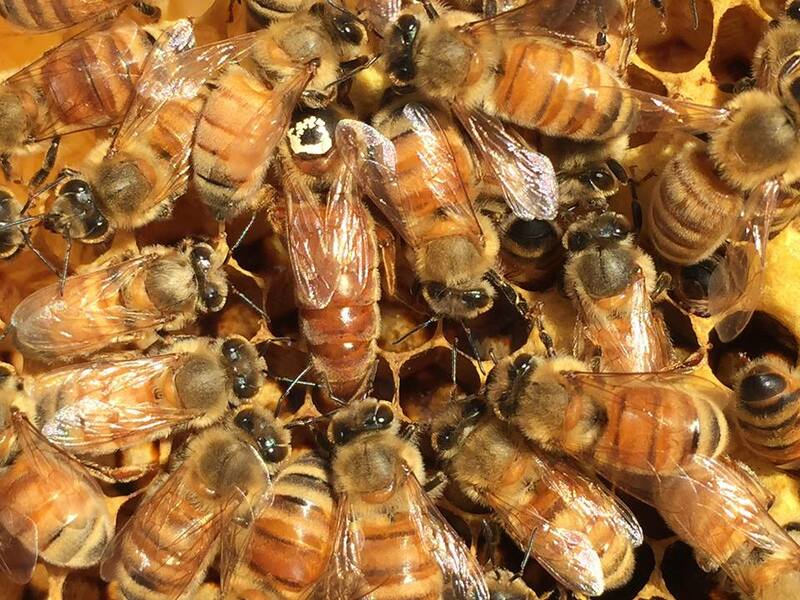 Over at the Amanda hive, Queenie is laying away trying to rebuild her numbers after February’s devastating poisoning. From only a few hundred bees she is up to a few thousand, with loads of capped cells waiting to hatch. 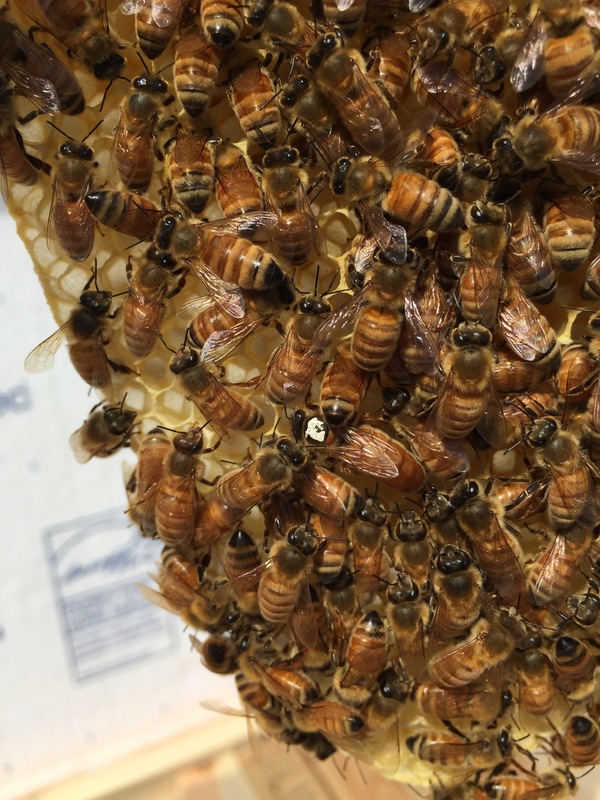 Amanda hive queen laying eggs with her attendants helping! The Amanda worker sisters have been VERY busy house cleaning. 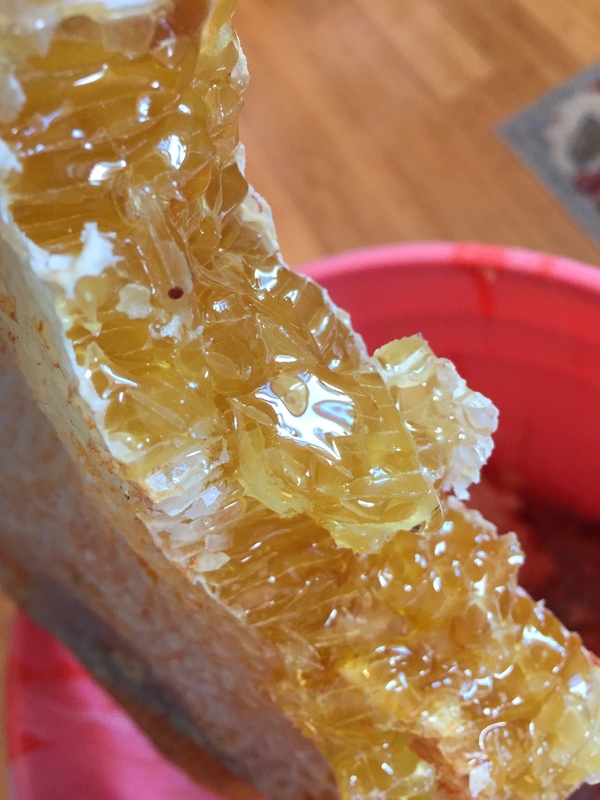 The old comb wasn’t ready for the amount of new eggs that needed to be laid to replenish the hive and there weren’t enough workers to build anything new. 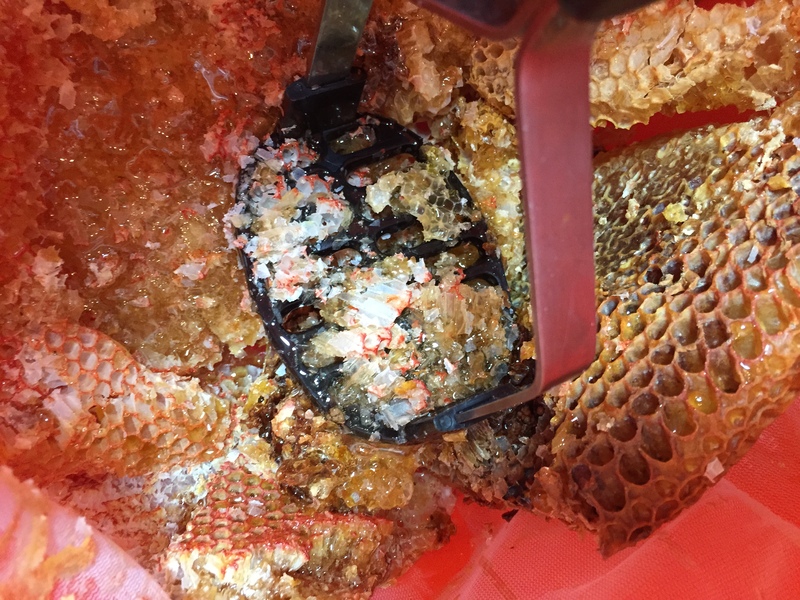 The cleaning out process was a lot of work for such a small amount of bees and I was glad that I had left all last year’s honeycomb for them so they didn’t have to forage as much. They’ve finally started bringing in pollen by the truck load but, consistent with their behavior last May, have not stored any new honey yet. 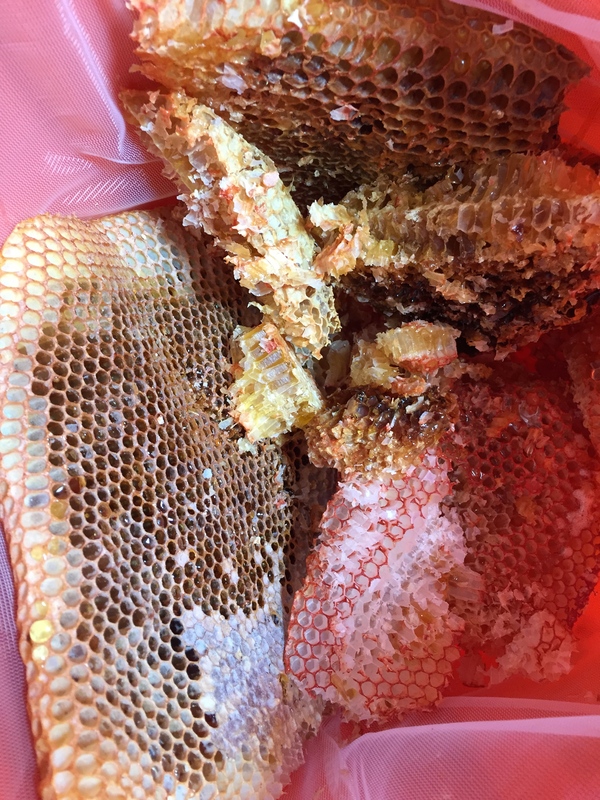 The Amanda hive had a moisture problem over the winter largely due to getting caught with so much uncapped (unripe) honey before the cold set in and it had quite a bit of moldy pollen. The sisters seem focused on cleaning it out, in some cases even chewing out whole sections of damaged comb. 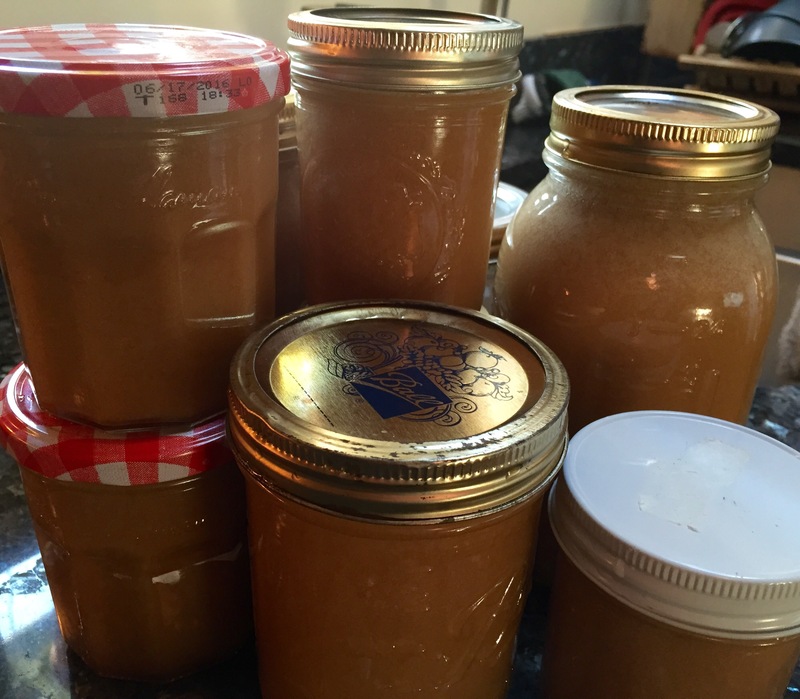 Lastly, earlier this month I finally took my share of honey – almost a gallon from four bars of comb! 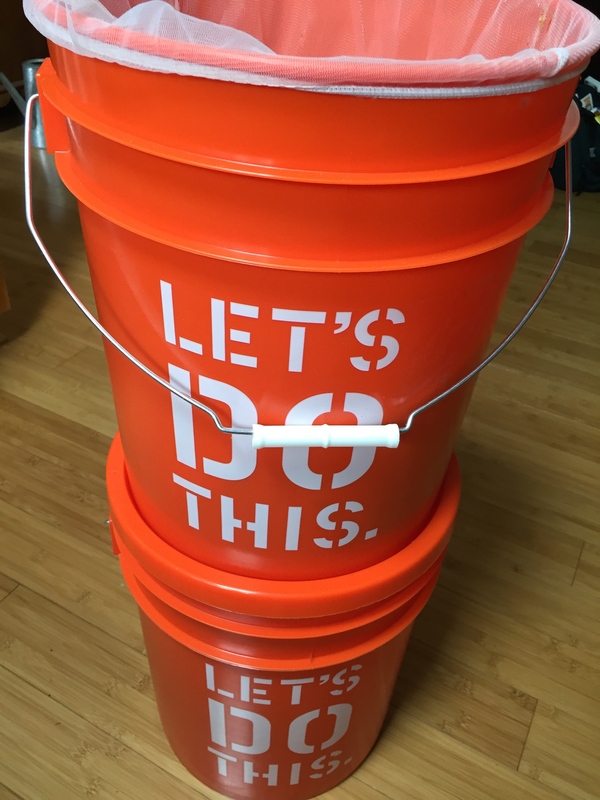 Then leave it drip from the top bucket with the net into the bottom bucket! 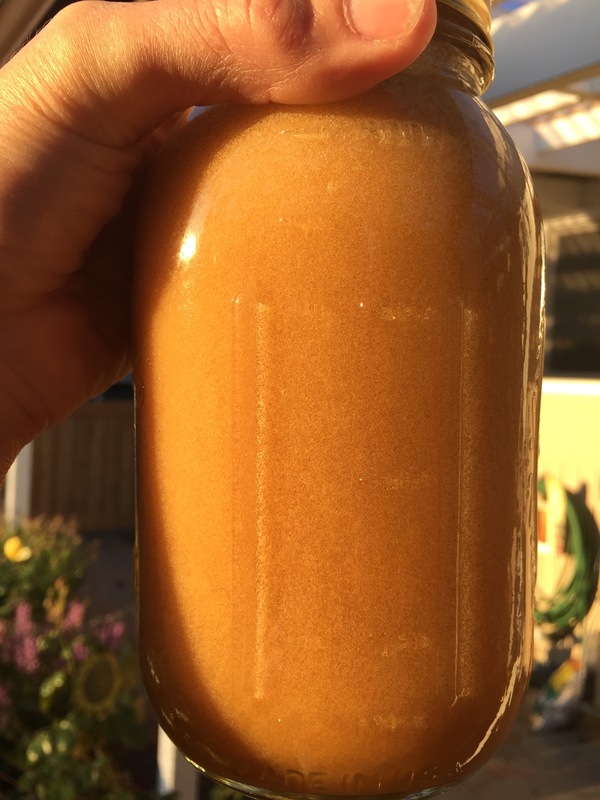 I ended up with almost a gallon of honey. 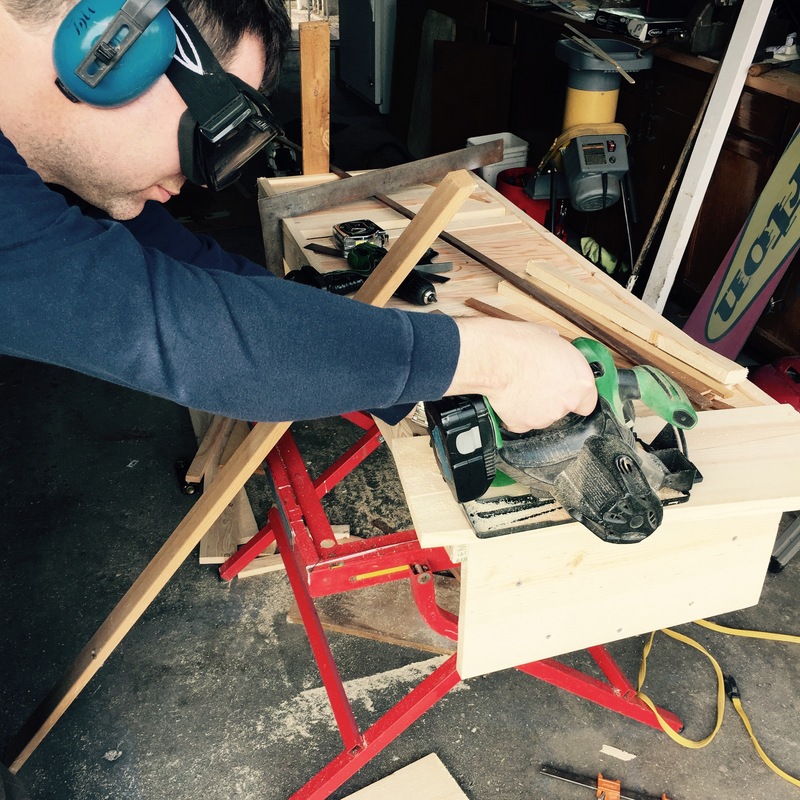 I don’t mind the slightly stronger taste – it would have been a waste to not use it all up! Now I just have to process the wax…. I think that catches us up! 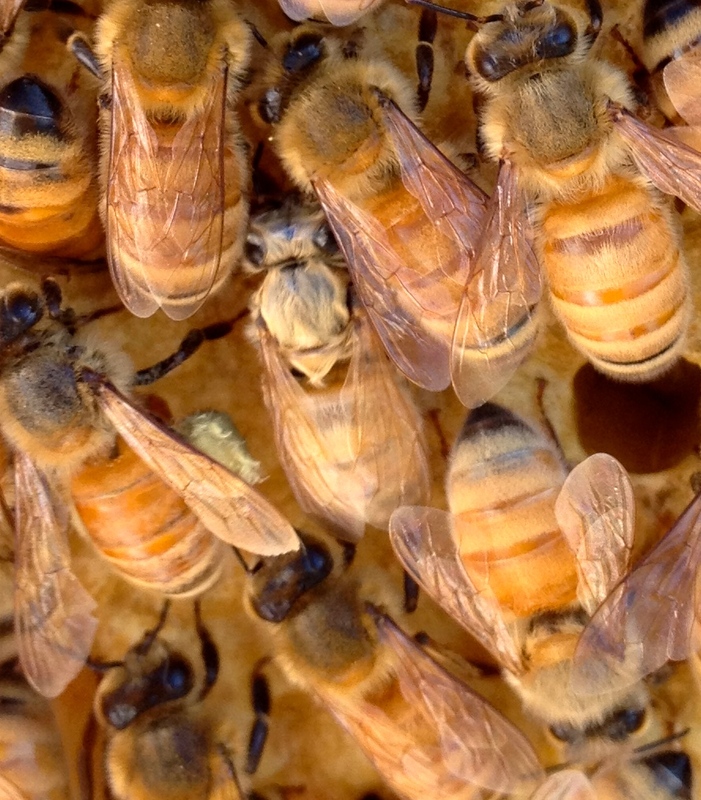 What is happening in your hives? Lovely photos! Glad all is well.